Brown Line's fleet, part of the Lynden family of companies, is among the most efficient fleets in the nation and the company has once again earned the SmartWay High Performer Award from the Environmental Protection Agency (EPA). According to the SmartWay Transport Partnership, just over two percent of all SmartWay carriers operate fleets so clean and efficient that they make the SmartWay High Performer list for all metrics. Whether its carbon, particulate matter or nitrogen oxide, high-performing SmartWay carriers drive cleaner, emit fewer of these pollutants – and burn less fuel – for every mile they travel and for every ton of freight they move, as compared to their SmartWay peers. "Our team is proud to receive this award two years in a row," says Brown Line President Bill Johansen. "We continue to work with our drivers on improving driving habits to minimize idle time, sudden starts and stops and to improve mileage. This recognition is shared with the entire Brown Line team." 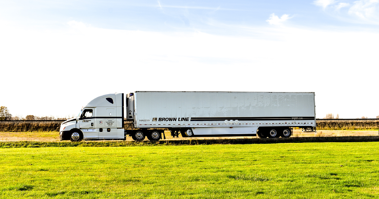 Since 2007, Brown Line has invested in new aerodynamic tractors and trailers, wide-base super single tires and high efficiency engines, dramatically improving miles per gallon (MPG), reducing idle time and lowering carbon emissions. In the last five years, Brown Line has improved its fuel economy by nearly 40 percent as reported to the U.S. EPA SmartWay Transport Partnership. Most of Brown Lines’ fleet is less than 5 years old. The new tractors are equipped with modern emissions control systems that significantly reduce air pollution. Since 2012, Brown Line’s fleet has reduced its nitrous oxide and particulate matter emissions per ton mile by 44 percent and 62 percent respectively. Over 75 percent of Brown Line reefer units are plug-in and have contributed to a nearly 90 percent decrease in idle time since 2010. "As new trailers are purchased our goal is 100 percent," Bill says. "This year we will be testing a new aerodynamic system in place of trailer tails that is designed to reduce the low pressure drag behind the trailer. The new system is expected to increase fuel economy and durability while reducing weight."